In 1944, Wilton Carlyle Dinges founded the Electrical Machine and Equipment Company (Emeco) in Hanover Pennsylvania utilizing the skills of local craftsman. During WWII the U.S government gave him a big assignment, make chairs that could withstand water, salt air and sailors. Make chairs lightweight and make them strong, build them for a lifetime. Aluminum was the obvious choice, engineered for practical purposes, designed by real people. 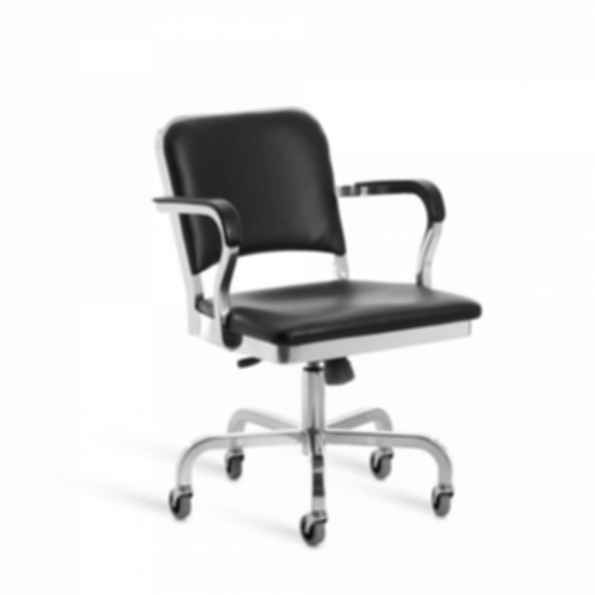 Emeco named the chair with a number: 1006, some people call it the Navy chair. We still call it the Ten-o-six. Forming, welding, grinding, heat-treating, finishing, anodizing- just a few of the 77 steps it takes to build an Emeco chair. No one else makes chairs this way. No one can. It takes a human eye to know when the process is done right, and it takes human hands to get it that way. Our goal. Make recycling obsolete and keep making things that last.